I am strategic in terms of my hotel choices. I always pick lodging near the things I want to spend time shooting. That way, when I get up early for sunrise, it's just a short walk until I can start firing away. I can also stay in bed a little longer, which is nice. Or if I end the day shooting there, it's a short walk home at night. I have (accidentally) done the opposite at times, and have seen the fabulous sunrise light disappear while I try to get into position. Don't ever do that - you will be doubly frustrated. First that you missed the light, and second that you even got up in the first place! Ha, or maybe the other way around. So when in Copenhagen, my hotel of choice is right down the street from Nyhavn, their historic harborfront entertainment area. It's such a beautiful spot and I find it endlessly interesting. The colorful buildings, the historic ships at port - it just feels like you stepped back in time a little bit. And in some ways, you have. On my recent weeklong stay there, I made sure at least once to get up and shoot sunrise, and as is often the case, it was well worth it. I frequently advocate shooting at sunrise. The light is generally great, but at least as importantly (and perhaps more so), all the tourists are still in bed. That gives me the opportunity to enjoy a normally busy place in near silence. It's awesome. Believe me, I also shot here after hours (during sunset and blue hour) and it is very busy. Still beautiful, but very busy. It is an entertainment area after all, so that's expected. It's also one of the most popular spots in Copenhagen (and for good reason, I might add). So on one morning, I made the short stroll over here and fired all the shots you see here today (plus a bunch of others too that I still need to process). It was quiet and there were just a few people out, which is why I got up early to shoot it. In fact, I went back another morning to shoot it again. Yeah, I guess I have a thing for Nyhavn - a bit of an addiction, if you will. 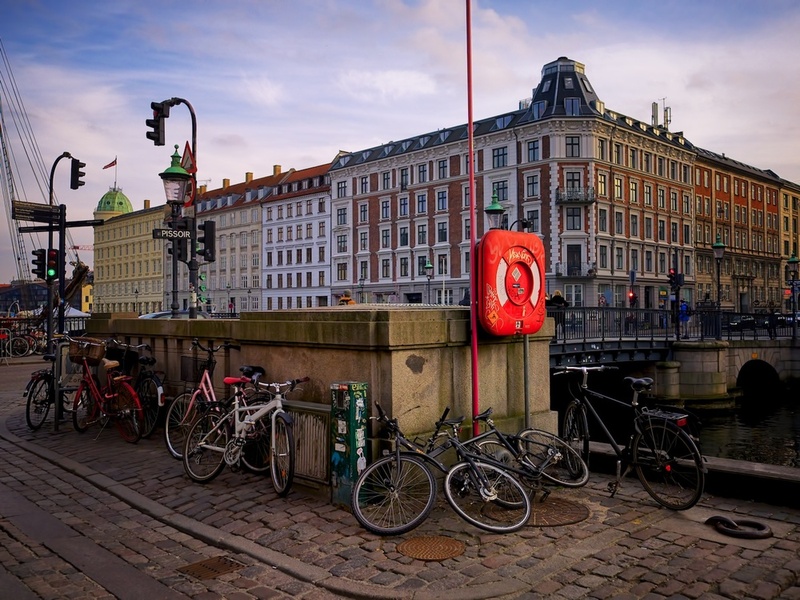 In fact, I shot at Nyhavn 4 or 5 times while I was there. I was back there for sunset and blue hour another evening, and even spent my last night in Copenhagen wandering here and shooting through sunset and blue hour, even though it had been raining. I don't mind the rain, since it provides a bit of interest and really accentuates reflected light. So this is a long way of saying that I have quite a few more photos from Nyhavn to share with you. However, on this trip (as I mentioned in my last post), I tried very hard to do things differently. I spent several years roaming different cities across the globe and firing away with my wide-angle lens. Now that I have converted to mirrorless, I find that I am shooting much differently. I'm rarely even using the wide-angle lens I have for my Olympus OMD EM-1 camera. I shot so many wide-angle photos at Nyhavn on previous trips (and admittedly, need to process a bunch still from those trips!) that I just didn't want to do that again. I wanted to come home with photos that were more than just repeats of shots I had taken last time. So I tried hard to capture the scenes in a different way on this trip. I tried to capture some of the little details that I encountered, and tried to focus in on some small things too. I did none of this in years past, so even taking a few is a small victory. But on this trip I found that I was doing this more and more. While I will still shoot somewhat wide these days, I also spend more time shooting much closer in and focusing on the little things. It's a refreshing change, actually. I'm having a great time doing it, and having a great time processing and sharing the pics too. I hope you enjoy viewing all these photos. Thanks for stopping by today!